In a span of three days, Bob Gibson experienced the emotional swing of being honored for his Cardinals achievements before ending his career on a downturn. The Cardinals designated Sept. 1, 1975, as Bob Gibson Day. Gibson, 39, was feted in an hour-long ceremony before the Cubs played the Cardinals in front of 48,435 spectators on a Labor Day afternoon at St. Louis. Two days later, Sept. 3, Gibson yielded a grand slam and took the loss in his final Cardinals appearance. Before reporting to spring training, Gibson had said 1975 would be his last year as a player. He began the season in the starting rotation but was shifted to the bullpen during the summer. The Gibson Day event was an opportunity to salute the Cardinals’ all-time best pitcher. 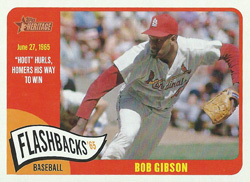 Gibson was the ace on 1960s Cardinals clubs that won three National League pennants and two World Series titles. He is the franchise’s career leader in wins (251), shutouts (56), strikeouts (3,117), complete games (255), innings pitched (3,884.1) and games started (482). In a ceremony at home plate, the Cardinals declared Gibson’s uniform No. 45 would join the No. 6 of Stan Musial and the No. 17 of Dizzy Dean as the only numbers retired by the franchise. Club owner Gussie Busch presented Gibson with a $32,250 luxury motor home. Then it was Gibson’s turn to address the crowd. On Sept. 3, in the finale of the series, the Cubs led, 6-1, before the Cardinals rallied for five runs in the sixth, tying the score at 6-6. Sensing an opportunity to give his fading star another shot at glory, Cardinals manager Red Schoendienst called on Gibson to relieve starter Ron Reed and hold the Cubs in the seventh. The Cubs loaded the bases on a Champ Summers infield single and walks to Jose Cardenal and Andre Thornton. With two outs, Gibson uncorked a wild pitch and Gene Hiser, running for Summers, raced home from third, giving the Cubs a 7-6 lead. Gibson issued an intentional walk to Jerry Morales, reloading the bases. With the count 3-and-2, LaCock stunned Gibson by drilling a fastball over the right-field wall for a home run _ the lone grand slam of his big-league career. Gibson remained idle while the Cardinals fell out of contention. On Sept. 15, two weeks after his special day, Gibson said goodbye to his teammates and headed home with 10 games remaining in the season, knowing he’d never pitch again.